HOW BRINGING RABBI NACHMAN TURNS A MAN INTO A TZADDIK! Yehuda and Beit Israel: Beit Israel is actually the descendants of Efraim, not to be confused with the descendants of Yehuda and the tribes called the children of Israel. These two categories of Israel will unite in the end of days to annihilate Evil and bring the reign of peace. Yehuda and Josef are in a face off as everyone knows. Josef is the saint and many claim that Yehuda takes the role of King and suppresses the saint. I strongly reject this oversimplified explanation, that avoids a true understanding of the issue. Why is it written these are the generations of Jacob, Josef? Josef isn't even a tribe! When pre-flood generations were mentioned generally only the first born were mentioned by name (exception for the sons of Noah). 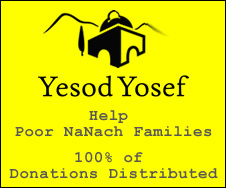 Although all the descendants of Jacob are numbered 70, the only one who is THE descendant is Josef (a reminder of pre-flood days). In the face off between Josef and Yehuda, Josef tested Yehuda to make sure this intelligent but sinful man had faith in the all-mighty and was NOT the idol worshiper he logically seemed to be. The proof came...THIS WAY: Yehuda knew that if he went back to Canaan without Benjamin, Jacob would kill him as well as all the brothers, (fear of the tzaddik) furthermore Yehuda had no doubt that if he remained in Egypt he would not only save his own life but eliminate Josef (who he thought was an Egyptian prince). He knew that if this "prince" was responsible for the death of all the tribes, as a result, he certainly would not have any divine support. He Yehuda on the other hand would still be bound by his word to save Benyamin, and relieve his holy father. He knew he could then succeed and this gave him "holy-ness" (this shows an understanding of G-d). Josef understood at this point that Yehuda was ready to take over Josef's position of Tzaddik, if Josef made one more step in the direction he claimed. Josef was check-mated, and backed down, but maintained his role.